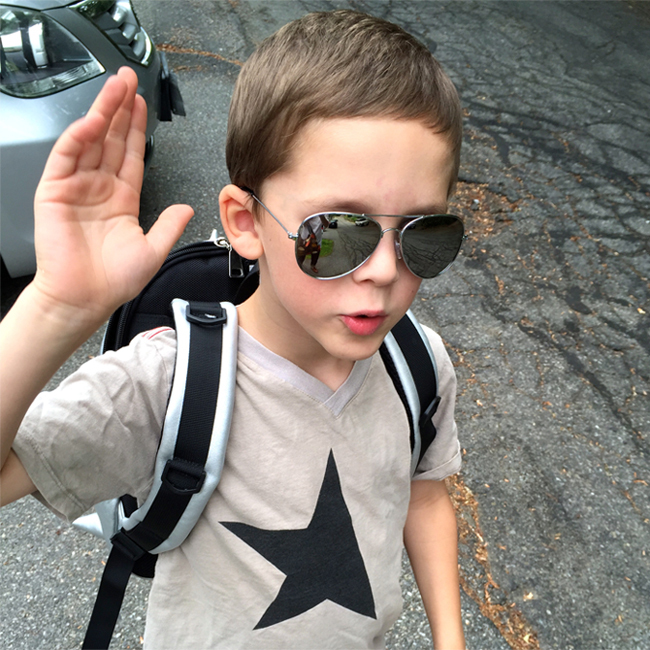 Shirt by Joah Love, backpack by Madpax, and kids' aviator shades. 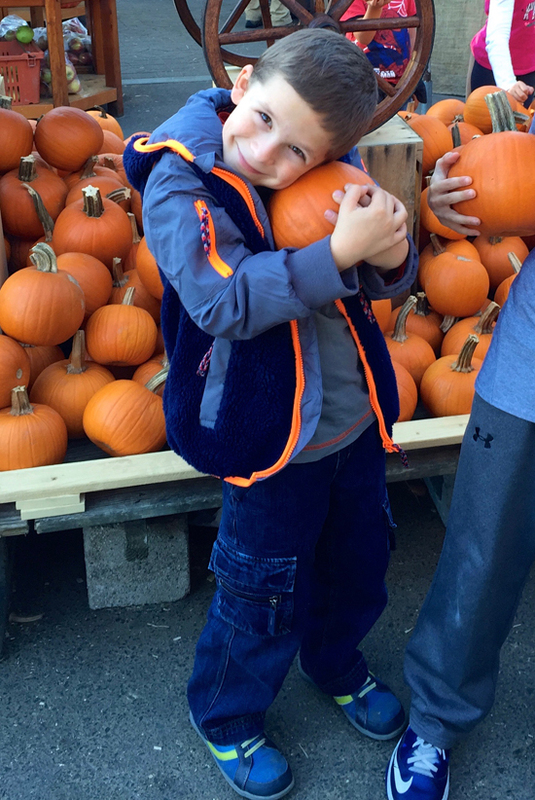 I have two boys, so that's my focus when it comes to clothing. Many of the following brands make super cute clothing for BOTH genders though! Andy & Evan - This is our go-to brand for our rare dress up days. They also have nice cotton hoodies with contrasting details (hood linings and elbow patches) I have a thing for elbow patches on little boys clothes, love them! And Andy & Evan is very affordable while maintaining great quality (a lot of their basics look like Janie and Jack, listed below, but for much less than J & J's retail). This is one brand you can often buy for much less than the website prices. Check Amazon for sales. We have bought most of our cardigans and hoodies for under $20, including shipping. This brand runs true to size. Hanna Andersson - This line, started by a Swedish mom and her American husband in 1983, is the gold-standard for quality American kids clothing. Hanna clothes are HARD to wear out (and believe me, we've tried). 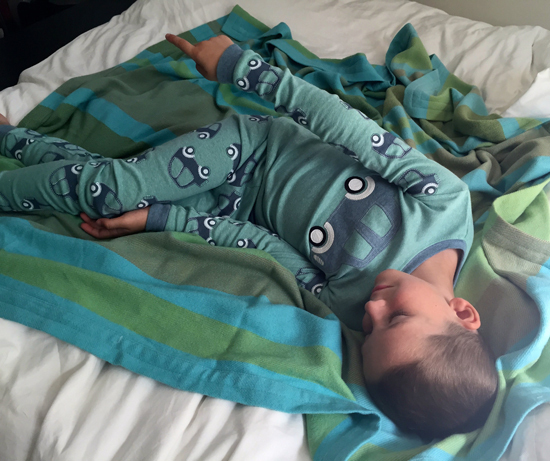 Colors stay true in the wash, knees take forever to rip through, and Pjs feel even softer and comfier after being worn heavily by two kids. I prefer their simpler solids, stripes and color-block designs to most of their appliqués and screen prints, because some of it looks a little too "young" for my taste. Their clothes tend to be cut a little bit to the short/wide side, so they don't always work for my older, skinny-as-a-pole son. Sizes are Euro-style. Buy during their sales and you'll save a bundle, Hanna quality comes with a big Hanna price tag. Free shipping available if you order from the website, if you have your purchase shipped to your local store, and then pick up at your convenience. On your very first order, get 20% off for using my link here. Hatley - Playful, rich, intense colors and fun prints. Possibly the best raincoats out there, with adorable prints, a nice cotton lining and soft, flexible non-shiny exterior. And their pajamas!!! I love the way Hatley really breaks out of the boy/girl traditional roles for color. 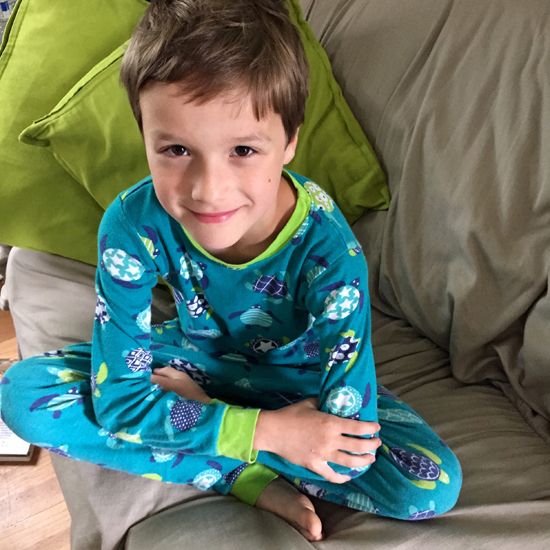 See My son has some gorgeous turquoise and lime green Hatley turtle pajamas. Amazon is the best place to get Hatley at a hefty discount. 6PM (Zappos' outlet store) often has good discounts as well. They have some incredible sales at end-of-season or on items that are being discontinued. 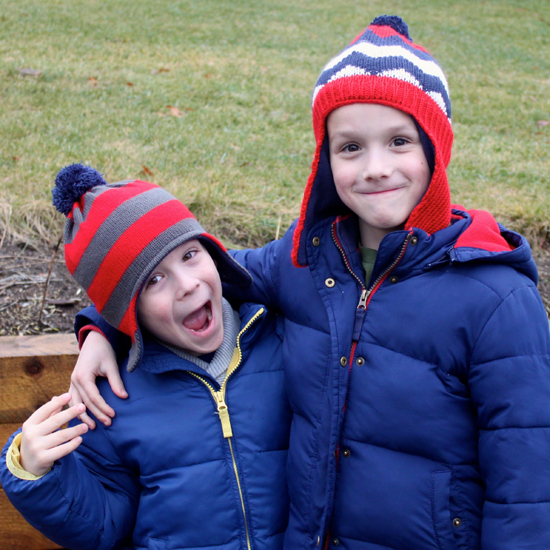 Janie and Jack - Although most of their styles are too preppy and/or dressy for my casual boys, they have some killer deals on the markdown racks in their stores. Nice appliqué, themed t-shirts, dress clothes, dress shoes, sweaters, and soft-cotton reversible sweatshirts. Perfect for holiday family photos! You have got to check out their hats!! Mini Boden - Maybe my favorite! Beautiful detailing on everything this British company makes. Quality and customer service are excellent. Iconic, colorful appliqué tees with sewn on designs, the cutest boy socks (they come in a 7 pack sock-box, to match all sorts of different colored outfits.) My favorite thing Mini Boden makes is their warm, gorgeous lined pants for winter, which have a contrasting-color lining. And their winter jackets are wonderful too! See my reviews of past Boden sample sales if you live in PA, NY, or MA, and lots of ways to save money on Boden wherever you live. I find this brand general runs true to size. Remember to check Nordstrom markdowns for Boden - they have free shipping and returns on any amount! Alex (left) in Boden lined pants, shirt and socks. 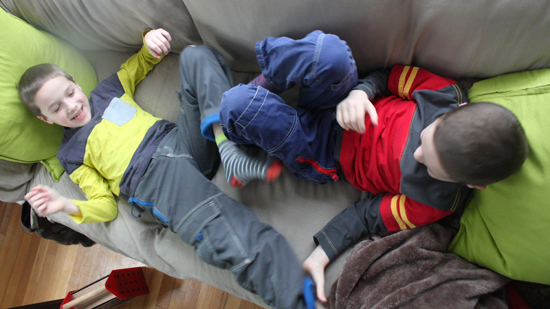 Chase (right) in Boden lined pants and socks, with a Hanna top. See Kai Run - There are lots of shoes I like but these have always been my favorites. The reason? The bright variety of colors and designs available, at a relatively low price. So pretty. You need to shop around to get the best deal on See Kai Run, because they have sales all over the place. After checking the SKR website itself, check Amazon. Then check 6PM - prices often fluctuate by the day. 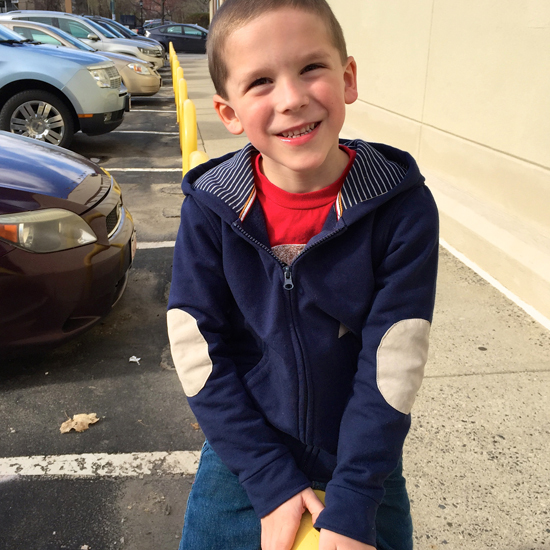 Chase in Boden jacket, Hanna Andersson jeans, and See Kai Run sneakers. Tea Collection - First the good - Tea is ethically made, and consistently has amazing color and design to their pieces. Their designers go around the world to different places, study and photograph the graphic design in that region, and then capture the feeling of that area in one season's line. As a traveler and as a graphic designer, I LOVE this! Past collections have included India, China, Japan, Bali, Turkey, etc… I am always curious to see what's next. They have a way of integrating images and type that is so visually appealing. However, Tea tends to fade and stain more easily than a lot of the other brands on this list. So you aren't supposed to put it into the dryer, and you must stain treat it right away. (We use this stuff. It's the BEST.) I've also been told by Tea aficionados that washing your Tea with a cup of vinegar when you first buy it will help preserve the colors longer. Nevertheless, it's definitely in my top 3 favorites and has a cult following. Tea runs true to size or a bit big. 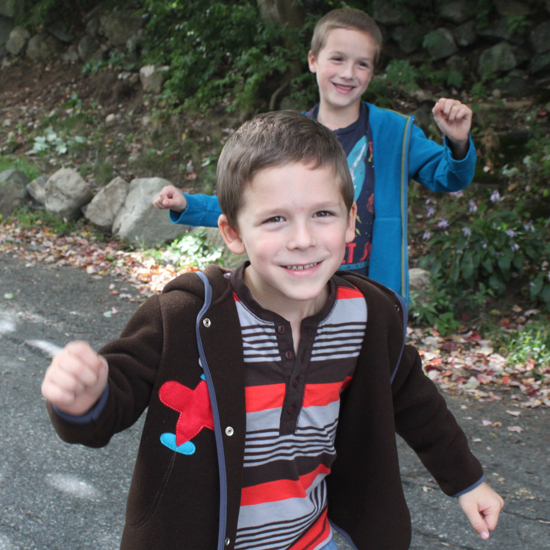 The boys pants/shorts run a full size big, whereas tops and jackets are a more true to size. Chase in a Tuff Kookooshka Fleece and Tea Collection shirt. Alex (back) in Tea Collection shirt and hoodie. Tuff Kookooshka - This company is small, ethically run and USA-made, and their outerwear and hat designs are absolutely adorable. Made of polartec fleece, the pieces are handmade, and they are perfect for New England Springs and Falls. My only complaint is that their jacket sizes only go up to size 6 (which my sons have long since outgrown). If they would keep making up to size 10, I'd keep buying! Recently featured themes include animals, florals, superheros, and mermaids. Check Zulily for sales, esp. around February. Venait car PJs with appliqué design. Vaenait - This is another extremely affordable brand with ultra cute stuff. Mostly soft appliqué pajamas. Go through the link and you can see page and pages of different styles, each one cuter than the next. And again, almost all of them only go up to size 6/7 (sigh..) which is considered an "XL". If you are between sizes, it is best to go up. I'm really annoyed that I didn't discover it when my kids were toddlers. If you're obsessed with pjs, you must try some of these. And if anyone from Vaenait is reading this, PLEASE start making more of your designs in the big-kid sizes! Post contains affiliate links. If you buy through my links, I will receive a merchandise credit or a small percentage of commission. Thanks for supporting Sample Sale Mom!! Sarah this blog is such a help I tell you. I normally buy clothes for my boys from Tea Collection and Mini Boden too. We can soo relate to each other. haha. nice blog . i like your post.keep blogging.